The striking black-and-orange monarch butterfly, once a common sight flitting through American backyards, has sharply declined in numbers in recent years. With a new two-year grant from the National Fish and Wildlife Foundation’s Monarch Butterfly Conservation Fund, the Wetlands Initiative will give this charismatic insect a helping hand in Illinois through habitat restoration at Midewin National Tallgrass Prairie and a special seed production effort at both Midewin and our Dixon Waterfowl Refuge. In partnership with the U.S. Forest Service and the National Forest Foundation, TWI is in the first full year of a major seven-year expansion of our restoration work at the country’s first National Tallgrass Prairie, located in Will County south of Joliet. Our plan to bring back 1,800 connected acres of diverse native prairie and wetland ecosystems at Midewin would have been a great boon for monarchs on its own. But TWI and Forest Service ecologists saw an opportunity to further enhance the project’s benefit for monarchs by incorporating strategies to increase milkweed, the monarch caterpillar’s only food. Monarch butterfly drinking nectar on butterfly weed, a common native milkweed species. Photo by Bob Chinn. The partners’ work over the next two years will involve planting a variety of milkweed species and many native wildflowers that are prime nectar sources for adult butterflies across 479 acres at Midewin. At the same time, TWI will establish in-field milkweed production zones at both Midewin and the Dixon Refuge, each intensively planted with one or two of nine targeted milkweed species. Over the past 20 years, the monarch butterfly population has declined by more than 80 percent across most of its range. The National Fish and Wildlife Foundation (NFWF) established the Monarch Butterfly Conservation Fund in 2015 in response to the butterfly’s widespread decline to help ensure the species’ survival. The public–private partnership is administered by NFWF with funding from the U.S. Fish and Wildlife Service, U.S. Forest Service, U.S. Geological Survey, Bureau of Land Management, USDA’s Natural Resources Conservation Service, and the Monsanto Company. The 2017 grant round focused on projects that will improve the availability of high-quality habitat for monarchs and/or increase capacity to expand monarch butterfly conservation efforts in the future. TWI’s grant was one of 23 awards totaling $3.77 million under this program in 2017. The competitive fund requires that each project have non-federal funding to match the NFWF award at least 1:1. TWI was able to provide a private match of more than 1:1 for our request, including grants from the Grand Victoria Foundation and the Gaylord & Dorothy Donnelley Foundation and anticipated in-kind contributions from the National Forest Foundation’s Midewin Youth Corps and volunteers at Midewin. 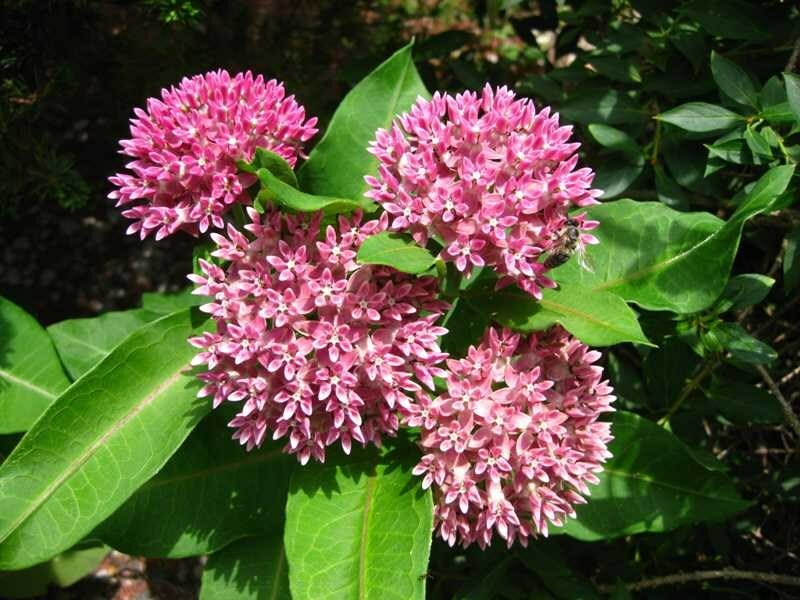 The targeted milkweed species range from the highly adaptable Common Milkweed and sweet-scented Swamp Milkweed to the rare Short Green Milkweed, a plant restricted to globally imperiled sand/gravel prairie habitats. Through partnerships, TWI and Forest Service ecologists will collect seed of the scarce species from known wild populations at Midewin, the Dixon Refuge, and other area conservation sites managed by The Nature Conservancy and the Illinois Department of Natural Resources. They will also work with Illinois growers to propagate more plugs (seedlings) of these milkweed species in winter 2017 and 2018 for planting out at Midewin and the Dixon Refuge. Monarch butterflies and milkweed have a symbiotic relationship. Adult butterflies pollinate the plant when they drink its nectar. The milky juice in milkweed stems and leaves contains toxic and bitter-tasting compounds. When monarch caterpillars eat the leaves, they store the compounds in their bodies, making both caterpillar and adult butterfly bad-tasting to potential predators. Once a bird has tasted a beakful of monarch, it avoids them in the future; the insect’s bright coloring serves as a warning to stay away. This fascinating co-evolution isn’t the only reason people find monarchs so captivating. In late summer monarchs undertake an incredible journey from their breeding grounds in the eastern United States south to central Mexico, where that generation of butterflies overwinters by the millions in small areas of oyamel fir forest. Illinois falls squarely within the eastern migratory path of the monarch butterfly and once provided abundant milkweed for monarchs—much of which has now been lost due to industrial agriculture practices and other development. Through this project, the Wetlands Initiative and the U.S. Forest Service will work to reverse that trend of milkweed loss in the Prairie State. A map of the three tracts on which TWI and the U.S. Forest Service will be restoring prime monarch habitat at Midewin over the next two years. 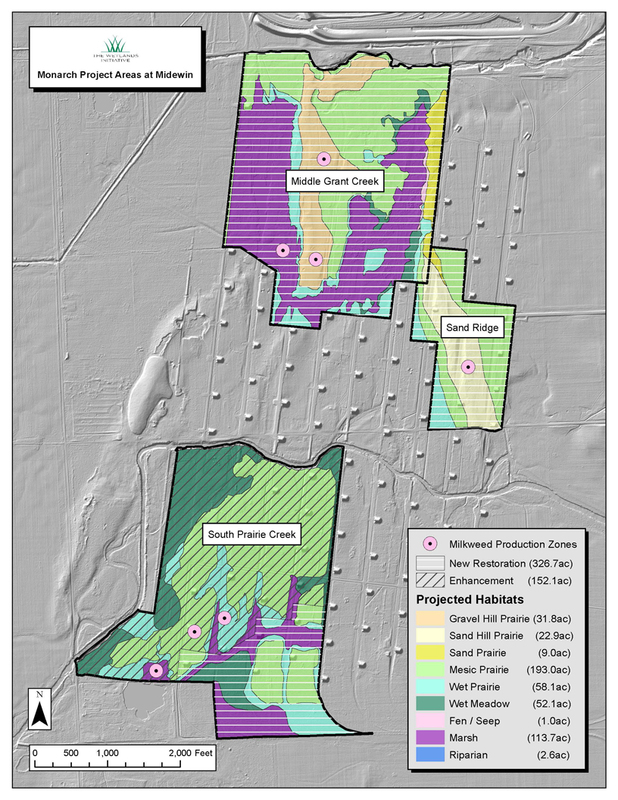 Pink circles mark the locations of in-field milkweed production zones. Map by Jim Monchak/TWI (click to enlarge). The 20,000-acre Midewin National Tallgrass Prairie and 3,000-acre Dixon Waterfowl Refuge—which contain some of the largest tracts of prairie habitat now found in Illinois—offer prime locations for bringing back abundant milkweed. Glass and Dr. Sullivan have selected locations at each site that should provide ideal habitat for each milkweed species to thrive in the in-field production zones. At Midewin, the “monarch hotspots” will be established on the South Prairie Creek, Middle Grant Creek, and Sand Ridge tracts, which TWI has been working to restore since 2016. At the Dixon Refuge, the milkweed production zones will be sited on the upland Hickory Hollow tract, which will provide the sandy savanna and prairie conditions preferred by some milkweeds such as the rare Purple Milkweed. Greater availability of milkweed seed will have broader conservation returns as well. As the production zones develop over time and begin to produce large amounts of seed, TWI and the Forest Service anticipate sharing excess seed with other conservation groups in Illinois for planting at their own sites. The rare Purple Milkweed is one of nine native milkweed species targeted for planting under TWI's project. It is adapted to dry, sandy savanna and prairie soils. Photo courtesy of the Missouri Botanical Garden. We hope that, in turn, the beautiful monarch butterfly will keep multiplying in Illinois for years to come.